For the engineering term applying to railway track geometry, see Track transition curve. Spiral viaduct near Brusio, Switzerland. A spiral (sometimes called a spiral loop or just loop) is a technique employed by railways to ascend steep hills. A railway spiral rises on a steady curve until it has completed a loop, passing over itself as it gains height, allowing the railway to gain vertical elevation in a relatively short horizontal distance. It is an alternative to a zig-zag, and avoids the need for the trains to stop and reverse direction while ascending. If the train is longer than the length of each loop it may be possible to view it looping above itself. The term "loop" is also often used for a railway that curves sharply and goes back on itself: if the railway crosses itself, then it forms a spiral; otherwise, it forms the much more common horseshoe curve or bend. 2 spirals between Tacuara and Meseta at 24°26′10″S 65°50′28″W﻿ / ﻿24.4361°S 65.8412°W﻿ / -24.4361; -65.8412 and 24°23′17″S 65°51′01″W﻿ / ﻿24.3881°S 65.8502°W﻿ / -24.3881; -65.8502 on the heritage Tren a las Nubes section of the Salta–Antofagasta railway part of the General Manuel Belgrano Railway. Spiral on the uphill track at Bethrunga 34°45′17″S 147°52′13″E﻿ / ﻿34.7545838°S 147.8703011°E﻿ / -34.7545838; 147.8703011 on the Main Southern railway line, New South Wales. The downhill track remains on the original steep plain 1 in 40 gradient. Spiral on the single track at Cougal 28°21′16″S 152°57′51″E﻿ / ﻿28.35439°S 152.964038°E﻿ / -28.35439; 152.964038 on the North Coast railway line, New South Wales. Double spiral at Big Hill at 51°25′28″N 116°25′17″W﻿ / ﻿51.4245778°N 116.42142°W﻿ / 51.4245778; -116.42142 on the approach to Kicking Horse Pass on the Canadian Pacific Railway route. There used to be a spiral at 48°21′57″N 53°23′45″W﻿ / ﻿48.3657°N 53.3958°W﻿ / 48.3657; -53.3958 at Trinity, Newfoundland on the former Newfoundland Railway. There used to be a spiral at Rogers Pass at 51°18′05″N 117°47′29″W﻿ / ﻿51.301389°N 117.7913966°W﻿ / 51.301389; -117.7913966 that was superseded when the Connaught Tunnel (British Columbia) was built. Spiral South of Baoji at 34°16′39″N 106°58′09″E﻿ / ﻿34.2776°N 106.9692°E﻿ / 34.2776; 106.9692 on the Baoji–Chengdu Railway. Spiral South of Baishiyan at 28°46′05″N 102°34′25″E﻿ / ﻿28.7680°N 102.5737°E﻿ / 28.7680; 102.5737 on the Chengdu–Kunming Railway. Spiral at Lewu at 28°17′52″N 102°37′21″E﻿ / ﻿28.2977°N 102.6226°E﻿ / 28.2977; 102.6226 on the Chengdu–Kunming Railway. Spiral at Wazu at 28°11′54″N 102°33′58″E﻿ / ﻿28.1983°N 102.5662°E﻿ / 28.1983; 102.5662 on the Chengdu–Kunming Railway. Spiral at Tiekou at 28°13′49″N 102°31′54″E﻿ / ﻿28.2304°N 102.5318°E﻿ / 28.2304; 102.5318 on the Chengdu–Kunming Railway. 2 spirals near Heijing at 25°26′15″N 101°44′52″E﻿ / ﻿25.4374°N 101.7478°E﻿ / 25.4374; 101.7478 on the Chengdu–Kunming Railway. Spiral at Shangshali at 48°47′36″N 121°43′39″E﻿ / ﻿48.7934°N 121.7274°E﻿ / 48.7934; 121.7274 on the Harbin–Manzhouli Railway. There used to be a series of spirals on the Southern Xinjiang Railway between Turpan and Korla. This line was rebuilt on a shorter route in 2014. There used to be a spiral at Guanjiao at 37°05′04″N 98°52′25″E﻿ / ﻿37.08442°N 98.873591°E﻿ / 37.08442; 98.873591 on the Qinghai–Tibet Railway. (see photo). Replica of the Brusio Spiral Viaduct at 10°28′44″N 84°49′25″W﻿ / ﻿10.47900°N 84.82374°W﻿ / 10.47900; -84.82374 on the Tren Turistico Arenal, 10 km east of Nuevo Arenal, Guanacaste. Just North of Fontan at 44°00′58″N 7°33′58″E﻿ / ﻿44.016°N 7.566°E﻿ / 44.016; 7.566. Saint Dalmas-de-Tende at 44°03′28″N 7°35′38″E﻿ / ﻿44.0577°N 7.5938°E﻿ / 44.0577; 7.5938. Tende at 44°05′55″N 7°35′44″E﻿ / ﻿44.0987°N 7.5955°E﻿ / 44.0987; 7.5955. Spiral at Moûtiers at 45°29′08″N 6°32′26″E﻿ / ﻿45.485628°N 6.540444°E﻿ / 45.485628; 6.540444 between Albertville and Bourg-Saint-Maurice used by TGV. There used to be a spiral in the Sayerce tunnel at 42°50′54″N 0°32′46″W﻿ / ﻿42.8483°N 0.546°W﻿ / 42.8483; -0.546 on the former Pau–Canfranc railway line between Pau and Zaragoza (Spain) in the Pyrenees. This spiral is now a footpath. The proposed spirals between The Gravenne and Montpezat at 44°41′42″N 4°13′05″E﻿ / ﻿44.695047°N 4.21797°E﻿ / 44.695047; 4.21797 on the partly completed Transcevenole line between Le Puy-en-Velay and Lalevade-d'Ardèche in the Cévennes were never constructed. Chunbati Loop at 26°50′30″N 88°20′28″E﻿ / ﻿26.8416944°N 88.3410351°E﻿ / 26.8416944; 88.3410351. Agony Point at 26°51′28″N 88°19′40″E﻿ / ﻿26.8576792°N 88.3277078°E﻿ / 26.8576792; 88.3277078. Batasia Loop at 27°01′00″N 88°14′50″E﻿ / ﻿27.0167882°N 88.2471805°E﻿ / 27.0167882; 88.2471805. The Darjeeling Himalayan Railway originally had five or six spirals but only five in operation at any one time. The line also has six reverses or zig-zags. Spirals near Dowgal station at 35°52′34″N 52°57′20″E﻿ / ﻿35.8762337°N 52.9554674°E﻿ / 35.8762337; 52.9554674 and extensive horseshoe curves in the Alborz Mountains on the Trans-Iranian Railway. The St. James's Gate Brewery, Dublin, Ireland formerly had an internal 1 ft 10 in (559 mm) gauge railway with a loop in a tunnel to gain height between buildings. There were three spirals at 42°44′29″N 12°46′58″E﻿ / ﻿42.7413°N 12.7828°E﻿ / 42.7413; 12.7828 Caprareccia and 42°44′29″N 12°49′12″E﻿ / ﻿42.7415°N 12.8199°E﻿ / 42.7415; 12.8199 and 42°44′45″N 12°49′13″E﻿ / ﻿42.7458°N 12.8204°E﻿ / 42.7458; 12.8204 near San Martino on the former Spoleto–Norcia line. There are three spirals on the 1,000 mm (3 ft 3 3⁄8 in) gauge railway line from Kenya to Uganda. This railway has been superseded by the Mombasa–Nairobi Standard Gauge Railway, which has removed the need for spirals by constructing tunnels and bridges. Spiral South of Mazeras at 3°59′44″S 39°32′39″E﻿ / ﻿3.995608°S 39.5441203°E﻿ / -3.995608; 39.5441203 near Mombasa. Spiral near Makutano station at : 0°02′36″S 35°38′29″E﻿ / ﻿0.043457°S 35.641461°E﻿ / -0.043457; 35.641461. Spiral near Equator station at 0°00′26″S 35°33′04″E﻿ / ﻿0.007183°S 35.551033°E﻿ / -0.007183; 35.551033. Spiral at Geumdae 2nd Tunnel at 37°16′26″N 128°01′18″E﻿ / ﻿37.2738°N 128.0216°E﻿ / 37.2738; 128.0216 between Geumgyo station and Chiak station on Jungang Line. There is one loop on a single track railway. A new double track tunnel is under construction to replace loop tunnel. Spiral at Daegang Tunnel at 36°55′15″N 128°22′46″E﻿ / ﻿36.9209°N 128.3795°E﻿ / 36.9209; 128.3795 between Danseong station and Jungnyeong station on the Jungang Line;– one loop, single track. Spiral at Hambaek 1st Tunnel at 37°13′19″N 128°42′10″E﻿ / ﻿37.2219°N 128.7027°E﻿ / 37.2219; 128.7027 between Hambaek station and Jodong station on the Hambaek Line;– one loop, single track. Spiral at Solan Tunnel at 37°09′31″N 129°01′51″E﻿ / ﻿37.1585°N 129.0308°E﻿ / 37.1585; 129.0308 between East Baeksan station and Dogye station on the Yeongdong Line. There is one loop on a single track railway but double track is installed in the middle of the tunnel to enable trains from opposing directions to pass each other. Spiral at Anjiro at 18°51′57″S 47°58′00″E﻿ / ﻿18.8657°S 47.9668°E﻿ / -18.8657; 47.9668 on the main line from Antananarivo to Toamasina. Spiral between Creel and San Rafael at 27°39′17″N 107°44′21″W﻿ / ﻿27.6548°N 107.7391°W﻿ / 27.6548; -107.7391 on the Ferrocarril Chihuahua al Pacífico. One spiral on the Burma Mines Railway at 23°06′13″N 97°19′23″E﻿ / ﻿23.103540°N 97.323176°E﻿ / 23.103540; 97.323176. One spiral close to Shwenyaung at 20°44′06″N 96°51′48″E﻿ / ﻿20.7349°N 96.8633113°E﻿ / 20.7349; 96.8633113 on the Thazi-Taunggyi line. Raurimu Spiral at 39°07′13″S 175°24′04″E﻿ / ﻿39.120337°S 175.4010443°E﻿ / -39.120337; 175.4010443 on the North Island Main Trunk. 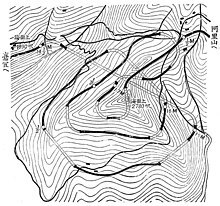 The line is single track and involves two short tunnels around a suitable hill. Spiral on the Driving Creek Railway at 36°44′07″S 175°30′20″E﻿ / ﻿36.73535°S 175.50551°E﻿ / -36.73535; 175.50551. This railway also has several reverses or zig-zags. There used to be a spiral on the Ellis and Burnand Tramway, Ongarue, which closed in 1958 and is now part of the Timber Trail. Spiral on the Flåm Line between Myrdal and Flåm at 60°44′38″N 7°07′53″E﻿ / ﻿60.744°N 7.1315°E﻿ / 60.744; 7.1315. (Tуапсе) through Gornyy to Belorechensk (Белореченск). Spiral at Telgártska slučka at 48°51′18″N 20°11′28″E﻿ / ﻿48.855024°N 20.1912296°E﻿ / 48.855024; 20.1912296 on the Brezno to Gelnica Line. The spiral is constructed of two viaducts and a 1,200m tunnel. Spiral near Komga at 32°32′04″S 27°59′32″E﻿ / ﻿32.5343497°S 27.9921599°E﻿ / -32.5343497; 27.9921599 on the branch line to Mthatha as it descends to the Great Kei River. Spiral at Van Reenen's Pass at 28°22′15″S 29°23′17″E﻿ / ﻿28.3707°S 29.3881°E﻿ / -28.3707; 29.3881 on the line from Harrismith to Ladysmith. Spiral at Demodara railway station at 6°54′10″N 81°03′47″E﻿ / ﻿6.902874°N 81.062919°E﻿ / 6.902874; 81.062919 on the line from Bandarawela to Badulla. Demodara railway station is located above the spiral tunnel. Spiral South of Gletsch at 46°33′28″N 8°21′18″E﻿ / ﻿46.5577°N 8.3550773°E﻿ / 46.5577; 8.3550773 on the former Furka Oberalp Bahn, now Dampfbahn Furka-Bergstrecke Heritage Railway. This is a single track partial rack railway with the catenary equipment removed. Triple spiral at Dulishan at 23°32′11″N 120°36′07″E﻿ / ﻿23.5363374°N 120.6019135°E﻿ / 23.5363374; 120.6019135 on the Alishan Forest Railway. There used to be a spiral at Circle Hill 0°11′25″N 30°21′48″E﻿ / ﻿0.1902°N 30.3634°E﻿ / 0.1902; 30.3634 on the Western Uganda Extension of the Kenya to Uganda Railway Line to Kasese. The bridge on the spiral loop at Dduallt on the Ffestiniog Railway, Wales. Spiral around Dduallt railway station at 52°57′37″N 3°58′07″W﻿ / ﻿52.9602°N 3.9686°W﻿ / 52.9602; -3.9686 on the Ffestiniog Railway in Wales. The line at 50°26′43″N 4°28′37″W﻿ / ﻿50.4451597°N 4.4768321°W﻿ / 50.4451597; -4.4768321 from Moorswater cement terminal, through Coombe Junction and Liskeard on the Looe Valley Line and on over Moorswater Viaduct forms a complete spiral, climbing up to join the main line at Liskeard. Not all parts are used by passenger trains. Tehachapi Loop, on the Union Pacific Railroad, California, United States, viewed from the air. Tehachapi Loop, at Tehachapi, California at 35°12′03″N 118°32′13″W﻿ / ﻿35.200833°N 118.536944°W﻿ / 35.200833; -118.536944 on the former Southern Pacific Railroad, now part of Union Pacific Railroad. Williams Loop, east of East Quincy, California at 39°54′36″N 120°48′29″W﻿ / ﻿39.910131°N 120.807949°W﻿ / 39.910131; -120.807949 on the former Western Pacific Railroad now part of Union Pacific Railroad. Hiwassee Loop, also known as the Hook and Eye; 2 miles NNE of Farner, Tennessee at 35°10′53″N 84°17′59″W﻿ / ﻿35.181257°N 84.299707°W﻿ / 35.181257; -84.299707 on the former Atlanta, Knoxville and Northern Railway now operated as a heritage railroad by the Tennessee Valley Railroad Museum, which operates excursion trains from Etowah, Tennessee to Copperhill, Tennessee via the loop, as well as trains just to the loop and back from Etowah. Georgetown Loop, at Georgetown, Colorado at 39°42′02″N 105°42′32″W﻿ / ﻿39.7005794°N 105.7087871°W﻿ / 39.7005794; -105.7087871 on the former Colorado Central Railroad. The spiral was completed in 1884, abandoned and dismantled in 1939, rebuilt between 1972 and 1984 and is now owned by History Colorado and operated as the Georgetown Loop Railroad. The MAX Red Line, a light rail line in Portland, Oregon, loops over itself at 45°31′51″N 122°33′49″W﻿ / ﻿45.5307°N 122.5636°W﻿ / 45.5307; -122.5636 in the vicinity of the Gateway Transit Center. Abandoned spiral at Riflesight Notch Loop at Rollinsville, Colorado on the former Denver and Salt Lake Railway route over Rollins Pass. The spiral was bypassed by the Moffat Tunnel built in 1928, and was dismantled in 1935. Abandoned spiral called Double Circle, or Double Loop, or The Golden Circle, at 39°58′48″N 117°02′06″W﻿ / ﻿39.98°N 117.035°W﻿ / 39.98; -117.035 east of Eureka, Utah on the former Tintic branch of the Denver and Rio Grande Western Railroad. It was bypassed in 1940 and the branch removed in 1943. Abandoned spiral on the Roaring Camp Railroad at 37°02′33″N 122°03′54″W﻿ / ﻿37.0426°N 122.0649°W﻿ / 37.0426; -122.0649. The spiral was completed in 1963. The spiral was bypassed by two switchbacks after a trestle fire in 1976. ^ Christian Wolmar (1 May 2014). The Iron Road: The Illustrated History of Railways. Dorling Kindersley Limited. pp. 170–. ISBN 978-0-241-18186-7. ^ S. M. Yameen Nachsch (1972). Railway Engineering. Caravan Book House. ^ William W. Hay (16 June 1982). Railroad Engineering. John Wiley & Sons. pp. 231–. ISBN 978-0-471-36400-9. ^ Jim Harter (2005). World Railways of the Nineteenth Century: A Pictorial History in Victorian Engravings. JHU Press. ISBN 978-0-8018-8089-6. ^ a b c John Brian Hollingsworth (1982). Atlas of the world's railways. Bison. ^ Axel Borsdorf; Christoph Stadel (12 March 2015). The Andes: A Geographical Portrait. Springer. pp. 273–. ISBN 978-3-319-03530-7. ^ Pons, Mónica. "The Train to the Clouds, Salta". Welcome Argentina. Retrieved 13 December 2017. ^ The Australian encyclopaedia. Michigan State University Press. 1958. ^ "Bethungra Spiral". Heritage Council of New South Wales. ^ "Cougal To Border Loop, Railway Spiral and Landscape". New South Wales State Heritage Register. Office of Environment and Heritage. Retrieved 25 November 2017. ^ William Alan Bayley (1973). Standard Gauge Railway Across Australia. Austrail Publications. ISBN 978-0-909597-09-2. ^ a b c d Brendan Fox; et al. (2011). The Thomas Cook Rail Map of Europe (Map) (18th ed.). 1:4000000. Cartography by Mary Spence. Thomas Cook Publishing. ISBN 978-1-84848-356-9. ^ a b c d Ball, Mike (20 March 2017). European Railway Atlas Regional Series, Romania, Bulgaria and Moldova. ^ a b c d e f g Ball, Mike (1 May 2016). European Railway Atlas. ^ a b c Подробна карта на България (A detailed Map of Bulgaria) (Map). 1:380000. ДатаМап-Европа ООД (DataMap Europe). 2014. ISBN 978-954-519-036-0. ^ Jane's World Railways. Sampson Low, Marston; New York: Rand McNally. 1960. ^ Graeme Pole (1 January 1995). The Spiral Tunnels and the Big Hill: A Canadian Railway Adventure. Altitude Publishing Canada Limited. ISBN 978-1-55153-907-2. ^ Barry D. Stewart (2004). Across the Land --a Canadian Journey of Discovery. Trafford Publishing. pp. 224–. ISBN 978-1-4120-2276-7. ^ L.D. Cross (21 July 2014). High Peaks Engineering: Rocky Mountain Marvels. Heritage House Publishing Co. pp. 93–. ISBN 978-1-927527-80-1. ^ Les Harding (5 February 2008). The Newfoundland Railway, 1898-1969: A History. McFarland. pp. 86–. ISBN 978-1-4766-0839-6. ^ Heritage Foundation of Newfoundland and Labrador (January 2011). "Trinity Train Loop". Retrieved 25 October 2017. ^ Heritage Foundation of Newfoundland and Labrador. "Trinity Train Loop Registered Heritage Structure". Retrieved 25 October 2017. ^ Art Downs (1 May 1985). Incredible Rogers Pass. Heritage House Publishing Co. pp. 27–. ISBN 978-0-919214-08-8. ^ a b c d e Quail Map Company (2008). China Railway Atlas (third ed.). Quail Map Company. ISBN 978-1-898319-82-5. ^ Yuan Lei (2014-12-29). "袁蕾, 吐库二线正式开通运营 南疆铁路进入电气化时代 新疆日报" [Yuan Lei, spit library second-tier official opening and operation of the Southern Xinjiang Railway electrification into the Xinjiang Daily Times (Machine generated)] (in Chinese). Retrieved 2016-07-04. ^ Devereux, Nigel (September 2017). "Costa Rican rail variety". The Railway Magazine. Mortons Media Group Ltd.: 104. ^ "Friends of Latin American Railways". Retrieved 13 November 2018. ^ a b Ball, Mike (3 September 2017). European Railway Atlas Regional Series, The Balkans. ^ a b Benjaminse Uitgeverij BV (2013). A Travellers' Railway map of Europe (Map) (3rd ed.). 1:3800000. Cartography by Carto Studio BV. Benjaminse Uitgeverij BV. ISBN 978-90-77899-09-0. ^ a b c d e Ball, Mike (15 July 2016). European Railway Atlas Regional Series, Italy. ^ a b Braun, Michel (April 2017). "The Col de Tende Line: A tortuous route and history". Today's Railways Europe. Sheffield, England: Platform 5 Publishing. ^ a b c Michelin Editions des Voyages. Michelin. 10 January 2011. ISBN 978-2-06-715561-9. ^ "La Boucle Loop Tunnel". Structurae:International Database and Gallery of Structures. Retrieved 15 December 2017. ^ "Moûtiers, très ferroviphile en 2013 !". Actu Montagne. The Serac Editions. Retrieved 15 December 2017. ^ "INVENTAIRE des TUNNELS FERROVIAIRES de FRANCE" (PDF). Retrieved 24 June 2016. ^ C. Harald Harlinghausen; Hartmuth Merleker (1986). Germany Federal Republic. Nagel. ISBN 978-2-8263-0761-7. ^ W.J.K.Davies (1965). Railway Holiday in Northern Germany. David and Charles. ^ Great Britain. Naval Intelligence Division (1945). Germany: Ports and communications. Naval Intelligence Division. ^ a b c Terry Martin (2006). The Iron Sherpa: The Story of the Darjeeling Himalayan Railway, 1879-2006. The Iron Sherpa by T. Martin. ISBN 978-1-900622-10-3. ^ Going Loopy. Darjeeling Himalayan Railway Society. 2005. ISBN 0-9541602-2-3. ^ UNESCO World Heritage. "Mountain Railways of India". Retrieved 7 November 2017. ^ The Great Indian Railway Atlas. Samit Roychoudhury. 2005. ISBN 81-901457-0-3. ^ Ellison, Paul (December 1968). "Guinness Brewery Tramways". The Industrial Railway Record. The Industrial Railway Society. pp. 337–347. Retrieved 8 December 2017. ^ a b c d e f Atlante Stradale Italia (Road Atlas). Instituto Geografico DeAgostini. 2009. ISBN 9788851114398. ^ a b John Organ (November 2013). Sardinia and Sicily Narrow Gauge. Middleton Press. ISBN 978-1-908174-50-5. ^ "THE SIMPLON TUNNEL". The Capricornian. Rockhampton, Qld: National Library of Australia. 15 October 1904. p. 21. Retrieved 19 March 2013. ^ P. M. Kalla-Bishop (1967). Railway Holiday in Italy. David & Charles. ^ P. M. Kalla-Bishop (1970). Mediterranean island railways. A. M. Kelley. p. 47. ^ a b Ovenden, Mark (2007). Transit maps of the world. London: Penguin Books. ISBN 978-0-14-311265-5. ^ "Map of Naples Metro 2017" (PDF). Azienda Napoletana Mobilità (ANM). Retrieved 21 January 2018. ^ "The route of the former railway Spoleto-Norcia". Bella Umbria. Retrieved 16 December 2017. ^ a b c A History of Japanese Railways, 1872-1999. East Japan Railway Culture Foundation. 2000. ISBN 978-4-87513-089-5. ^ a b c d e f Shobunsha (2012). All-Japan Road Atlas. ISBN 4-398-60034-5. ^ a b National Defense Transportation Journal. National Defense Transportation Association. 1953. ^ "Kenya opens Nairobi-Mombasa Madaraka Express railway". BBC. BBC. Retrieved 22 December 2017. ^ "End of the line for 'Lunatic Express?' Kenya begins multi-billion dollar railway". CNN News. Retrieved 22 December 2017. ^ "Kenya's new Madaraka Express railway in pictures". BBC. BBC. Retrieved 22 December 2017. ^ a b Quail Map Company (1996). Korea, North and South Railway Map (Map). Quail Map Company. ISBN 978-1-898319-21-4. ^ "Voyages train voyageur (in French)". Madarail. Retrieved 16 December 2017. ^ "Route map". Chepe-Ferrocarril Barrancas del Cobre. Retrieved 13 December 2017. ^ Joseph Wampler (1969). New Rails to Old Towns: The Region and Story of the Ferrocarriles Chihuahua Al Pacífico. The Author. ^ Lonely Planet (1 August 2014). Great Journeys: Travel the World's Most Spectacular Routes. Lonely Planet Publications. ISBN 978-1-74360-593-6. ^ "On Burma Corporation Ltd". Australasian Institute of Mining and Metallurgy. Australasian Institute of Mining Engineers: 91. 1922. Retrieved 23 December 2017. ^ "Railway Gazette International". Railway Gazette International. Reed Business Pub. 66. 1937. Retrieved 23 December 2017. ^ Dickinson, Rob. "The Burma Mines Railway 1999". The International Steam Pages. Retrieved 8 December 2017. ^ Colin Metcalfe Enriquez (1935). Beautiful Burma. Myanmahita Magazine. ^ Bill Pierre (1 January 1981). North Island Main Trunk: An Illustrated History. A.H. & A.W. Reed. ISBN 978-0-589-01316-5. ^ a b c d e f g h Nock O.S. (1978). World Atlas of Railways. ISBN 0-86134-003-5. ^ Lang, Sarah (7 June 2009). "Coromandel: Water world". The New Zealand Herald. Retrieved 13 December 2017. ^ Mahoney, Paul (24 Sep 2007). "Bush trams and other log transport - Curves, trestles and inclines". Te Ara - the Encyclopedia of New Zealand. Retrieved 13 December 2017. ^ a b c Ian Allan Publishing (20 March 2015). Rail Atlas Europe. Ian Allan Publishing. ISBN 978-0-7110-3808-0. ^ South Africa; South Africa. Railways and Harbours Board (1947). Their Majesties the King and Queen and Their Royal Highnesses the Princess Elizabeth and the Princess Margaret in the Union of South Africa: February-April 1947. South African Railways. ^ Guide to Southern Africa. S. Low, Marston & Company. 1971. ^ "Kei Rail revival will support regional development". Railway Gazette International. 1 July 2008. Retrieved 23 December 2017. ^ Openbare Werke, Anleg, en Vervoer. Thomson Publications. 1959. ^ "NATAL-ORANGE FREE STATE railway link". The Railway Gazette. 115: 343. July 1961. ^ John R. Shorten; Johannesburg (South Africa). City Council (1970). The Johannesburg saga. John R. Shorten (Proprietary) ltd.
^ a b Collins Road Atlas: Spain and Portugal (Road Atlas). Collins. 2002. ISBN 0007140738. ^ "159-II" (Map). Torre del Bierzo (2nd ed.). 1:25000. Mapa Topografico Nacional de Espana. 2002. ^ P. N. Cumaranatunga (2009). Patriots of Lanka. P.N. Cumaranatunga. ISBN 978-955-658-116-4. ^ Ratnasinghe, Aryadasa. "Train to Badulla". The Sunday Times - Sri Lanka. Retrieved 13 December 2017. ^ a b c d e f g h i Ball, Mike (15 July 2016). European Railway Atlas Regional Series, Switzerland. ^ a b c d e John Westwood (2009). The Historical Atlas of World Railways. Cartographica Press. ISBN 978-1-84573-428-2. ^ Anthony J. Lambert (2005). Switzerland: Rail, Road, Lake. Bradt Travel Guides. ISBN 978-1-84162-132-6. ^ Quail Map Company (1 January 1993). China Railway Atlas (first ed.). Quail Map Company. ISBN 978-0-900609-94-7. ^ The Taiwan Railway 1966-1970. Loren Aandahl. 2011. ISBN 978-0-615-39162-5. ^ Mohamed Amin; Alastair Matheson; Duncan Willetts (1986). Railway across the Equator: the story of the East African line. Bodley Head. ISBN 978-0-370-30774-9. ^ G. T. Heavyside (1980). Narrow Gauge Into the Eighties. David and Charles. ISBN 978-0-7153-7979-0. ^ a b S. K. Baker (2010). Rail Atlas Great Britain and Ireland. Oxford Publishing Company. ISBN 978-0-86093-632-9. ^ Ian Allan Publishing (1982). Pre-Grouping Railway Junction Diagrams 1914. Ian Allan Publishing. ISBN 978-0-7110-1256-1. ^ P. R. Griswold (1992). Railroads of California: Seeing the State by Rail. American Traveler Press. ISBN 978-1-55838-121-6. ^ J. David Ingles (2001). Guide to North American Railroad Hot Spots. Kalmbach Publishing, Co. ISBN 978-0-89024-373-2. ^ Brian Solomon. Burlington Northern Santa Fe Railway. Voyageur Press. ISBN 978-1-61060-361-4. ^ Maury Klein (1972). History of the Louisville & Nashville Railroad. University Press of Kentucky. ISBN 0-8131-2915-X. ^ Phelps R. Griswold; Bob Griswold (1988). Railroads of Colorado: A Guide to Modern and Narrow Gauge Trains. American Traveler Press. ISBN 978-1-55838-088-2. ^ John William Howard (October 26, 2017). "TriMet considering expansion of MAX Red Line to county fairgrounds". Portland Tribune. Retrieved 2018-01-15. ^ R. A. LeMassena (June 1984). Colorado's mountain railroads. Smoking Stack Press. ^ "D&RGW Tintic Branch History". Retrieved 2016-09-13. ^ "Railroads and Mining at Tintic". Retrieved 2016-09-13. ^ "Eureka Ghost Rail: Tintic Range Railroad". Retrieved 2016-09-13. ^ Beniam Kifle; Nathan Goodman (2013). Roaring Camp Railroads. Arcadia Publishing. ISBN 978-1-4671-2996-1. Wikimedia Commons has media related to Spiral loops.